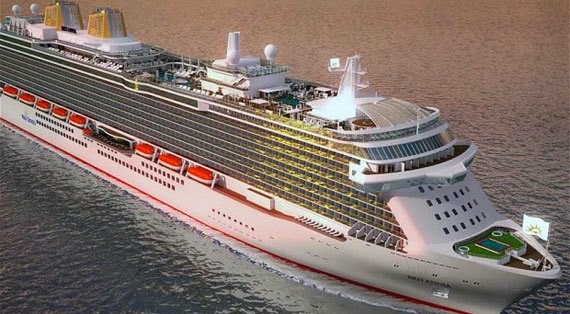 The UK’s biggest ocean liner will carry 5,700 people in total. Of which 4,372 will be passengers and 1,400 crew. This is more than the Royal Albert Hall at full capacity. Don’t worry, there will be enough facilities to accommodate this many people. 4 swimming pools, 15 passenger decks, 26 bars, restaurants and cafes mean that most guests will probably only experience a fraction of the ship’s amenities. The onboard art collection will be worth approximately £1million. A few eyebrows have been raised over a commercial cruise ship using the same name as the previous royal yacht. But P&O chief executive David Dingle has confirmed that, as he understands it, the royal family doesn’t object to it being named after the former Royal Yacht Britannia, which was scrapped by John Major’s government in 1997. It would be a right royal mess if they did mind, though, seeing as P&O’s life president, Lord Sterling, who organised the Queen’s silver and golden jubilee parties. Guests on the Britannia can of course expect to be treated like royalty, with a ratio of roughly one crew member for every four guests.